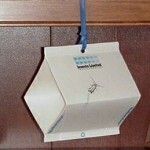 PRODUCT DESCRIPTION: Pheromone using trap which lures male codling moths inside. Once inside they will get stuck on the inserted glueboard. Once trapped they are not able to mate with females which will effectively decrease codling moth development in any orchard. Traps are weatherproof and will last several months. However, the pheromone is only active for about 1 month so the whole trap should be replaced monthly. WHERE TO USE IT: One per tree when used on small stands, perimeter placements are the preferred locations when monitoring commercial orchards so that spraying programs can be implemented once activity is noted. 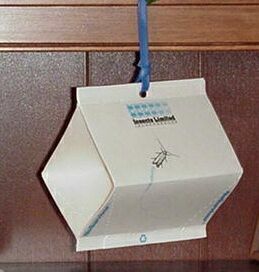 RATE OF APPLICATION: Though the trap will generally hold up longer than one month, the pheromone will only work strongly for 30 days. Be sure to change them every 30-60 days to ensure fresh scent is always available.